Isn’t this beautiful? It’s the first time this little Christmas Cactus has bloomed — it was given to me last year by the Thoughtful R’s, and I’ve done my best to care for it properly (actually, I was just trying to keep it alive). The flowers are just gorgeous, and there are buds on every leaf tip. The yarn is Cherry Tree Hill Supersock in the Martha’s Vineyard colorway, and the pattern is Erica Alexander’s Cable Rib Socks from IK Spring 2005. I’ve only gotten as far as the heel flap on the first sock, but that’s good; I’ve re-started these socks at least three times, never getting beyond the first two inches. It was the Lantern Moon DPN’s. They were calling out to be used, so I responded. I’ve wanted a set for a long time, and I got them at the Retreat. These are US 1’s; by the time I realized that I’d be a fool not to get some US 2’s as well, both vendors were sold out. That’ll teach me. Impulses are to be heeded! More needles = more socks! It’s all about the socks! So here’s my plan: [I do keep making plans don’t I? I mean well, and I’m earnest enough, but my follow-through stinks.] Anyway. I’m going to work a little bit every day on some of the beautiful but neglected projects (like V’s socks). I’m not going to give myself a hard time about them, because I don’t have any deadlines. 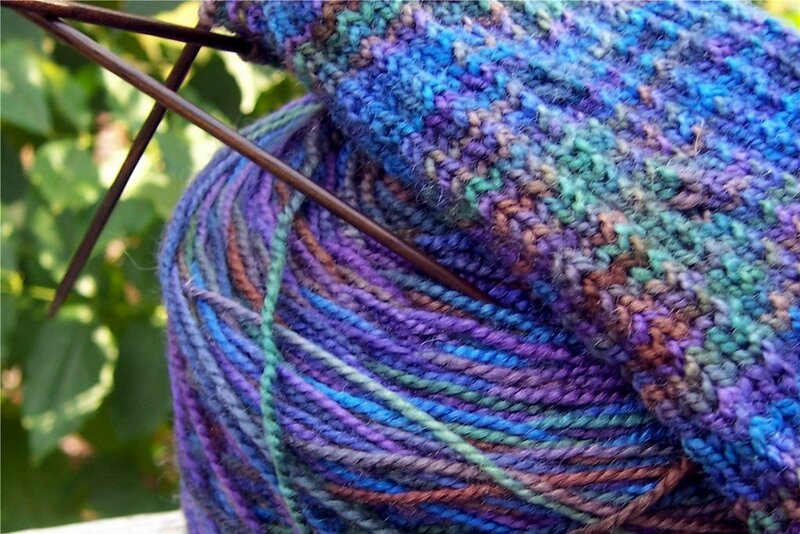 I’ll just knit along on This and That, and keep planning the reincarnation of my Manos Wildflower sweater. It might need to be something as simple as a v-neck pullover, and stockinette from one end to the other. I don’t want to fight the beautiful colors, but I don’t want to look like a giant sno-cone either. I guess I really am a Process Knitter. I leave a trail of unfinished pieces behind me, but I’m having fun and learning a lot. I do finish things eventually, I’ve realized, so there’s no reason to panic like I did in the summer. I’m over that phase. My stash isn’t out of control, but there’s enough there to satisfy most of my knitting urges. 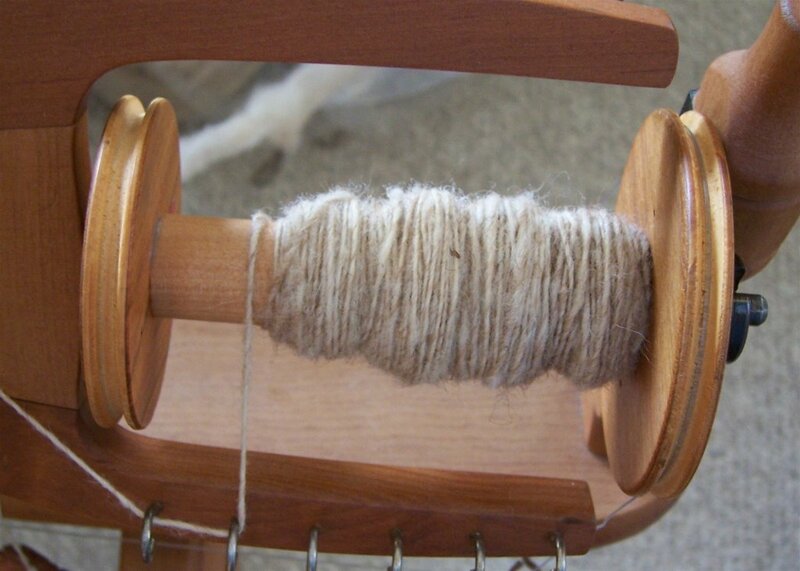 I want to spend more time spinning, and playing with all the lovely fibers that I’ve accumulated lately. That brings me to my deepest, darkest desire of the fiberly kind: I really want to think about buying K’s Reeves wheel because he might be wanting to part with it, and it’s the most beautiful thing in the world, and it was made by Rick Reeves Himself, and K has taken such good care of it, and every time I go to his house it’s there, sweet and golden, and when I stayed at K’s last week it was in my room and I swear I heard it say something to me (or it might have been the little boy scaredy-cat, but I think it really was the wheel). However, I have much to consider before acting on this desire, like space (of which I have none, even for another spinning wheel), and cost (because while K is generous, he is not a fool). Go ahead, you can think it — it’s not like I don’t know it already: I’m a goner. No, not exactly. The considerations are really very important, and since I know that K has no deadline, I get to take my time. Yep yep – hopeless. You’ve been bewitched. Now. Save your pennies and clear some space. There is always room for the right wheel!Still discovering things about the NBP as I knit along on it. Ahh…. I think I could find a little spare room for that wheel in my house, then you could buy it without reserve and visit me often!Can’t wait to see the NBP Scarf – I bet it’s breathtaking!My family has a curse when it comes to Christmas Cacti. They NEVER bloom when they’re supposed to. So we simply rename them. You, for example, have a Veteran’s Day Cactus. 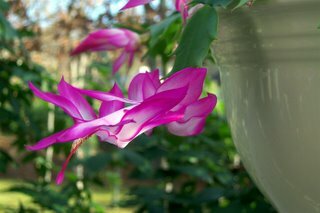 My mother has a Memorial Day Cactus, a Thanksgiving Cactus, and a Labor Day Cactus.